In February 2011, Dr. Richard Smith was awarded NSERC funding in the amount of $895,000 over 5 years for his Industrial Research Chair in Exploration Geophysics. 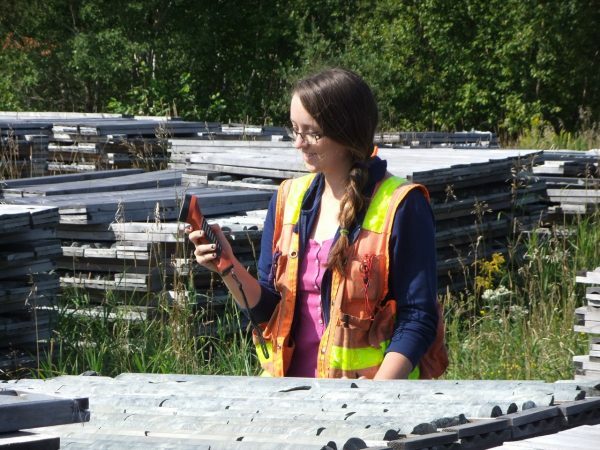 The position is sponsored by four industry partners-Vale, Glencore – SIO, KGHM International and Wallbridge Mining, each with large property positions and geophysical datasets in Sudbury. The Industrial Research Chair in Exploration Geophysics, held by Dr Richard Smith, has completed its five year mandate as of September 2015. The objectives of the Chair were to: increase the discovery and development potential of new ore bodies or mines through the creation of advanced geophysical tools; developing new methodologies for a better understanding of rock mass physical properties in order to reduce the risk profile associated with underground mining; and to train students to become highly qualified personnel (HQP) in new geophysical methods in order to explore for mineral deposits more effectively. In all, 25 students have been trained in Geophysics since the establishment of the Chair in 2010, under Dr. Smith. Theme 1: The Application of geophysics to the study of geological problems in the Sudbury Basin. Modeling has shown that there could be a dense (possibly mafic) block that had been thrust upwards close to the surface, potentially bringing host rocks for contact deposits within 4 km of the surface. Theme 2: Physical properties measurements — the link between geophysics and the geology. Different tools for measuring conductivity have different ranges of sensitivity, so in order to characterize rocks a number of tools will be required. Each tool has features that made them better than others for certain tasks or types of tasks. Theme 3: Collecting and processing electromagnetic data. A novel methodology for collecting electromagnetic data, deployed with multiple receivers and transmitters, can result in increased signal-to-noise ratios. It has greater depth reaching capacity than conventional tools. A tool for displaying all the data from this new system was developed. Theme 4: Developing new tools to model electromagnetic data. A tool for modelling radio imaging (RIM) data was developed. Synthetic RIM data for more complex situations is being developed. To identify signals caused by rockmass strain that could prove the feasibility of a real-time underground geophysical monitoring system and potentially track stress change, and thereby lead to improved safety. The use of physical property measurements to augment drill core logging procedures and improve techniques for the recognition and sub-division of important lithologies. To help geoscientists more effectively recognize and characterize potentially important rock units, which are otherwise visually unrecognizable from others, through the use of physical property measurements. Reviewing various RIM imaging methods through the investigation of the dampening effect on radio waves associated with RIM surveys. Early investigations indicate that results other than dampening occur. This will need to be investigated further and quantified in addition to also examining the imaging methods to see if they could be responsible for the effects. Re-processing and re-interpreting existing magnetic data to refine the geological understanding of the Sudbury Basin. Development of improved measurement procedures and instrumentation selection recommendations based on controlled experiments with 6 magnetic susceptibility meters, tools used for mineral exploration. The development of an approach to amplify weak signals produced by otherwise indiscernible and deeply buried conductors, like sulphide ore bodies. This was achieved by spatially stacking and combining EM receiver responses from different transmitter positions. A case history investigation into the methods to optimize how RIM geophysical technology and the software used to interpret results could be developed. The result was a manual of guidelines based on the verification of the findings. Development of two surface TDEM surveying methods to facilitate the mapping of conductance over “thin” targets. The method measures the vertical spatial gradient of the magnetic field for improved resolution/discrimination to produce a 2D (surface) map of conductance/resistance at each time channel/window. Investigation into how the signal produced by the RIM method changes when the system parameters or rock properties change. A better understanding of this would assist in the design of future surveys and data interpretation. In addition, a software-based modeler was developed, and shown to be an effective forward modeler of RIM data.